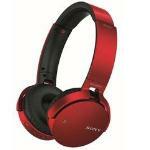 Sony MDR-XB650BT Expert Reviews - Read Reviews and Buy Smarter Online. Verdict: Sony has always been a pioneer when it comes to music. And the latest addition to its MDR range, the MDRXB650BT headphones, do its reputation no harm at all. We have seen many Bluetooth headsets but this one from the company is certainly eye catching for those who are looking for a stylish headset.